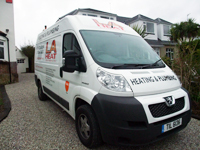 LA Heat is a local heating and plumbing company providing a friendly, reliable and professional service for all your heating and plumbing needs, from boiler servicing to complete bespoke heating system installations. We work with both domestic clients and developers and have over 35 years experience. Our business has been built upon our reputation for high standards and customer care, meeting your individual requirements is our priority. We are fully qualified Gas Safe and CORGI registered and all work is guaranteed. We provide a free consultation service where we can tailor a system to your own individual requirements. LA Heat (Southern) Ltd is a limited company registered in England and Wales.